It is with sadness the family of Horace Murray Alexander announce his passing on Tuesday April 2, 2019 at the age of 76. A son of the late Horace and Elizabeth Anne (Redstone) Alexander, he was born in Saint John, NB on October 24, 1942. Horace taught school in Maugerville, NB, Mahone Bay, NS, Lunenburg Community College for over 30 years. 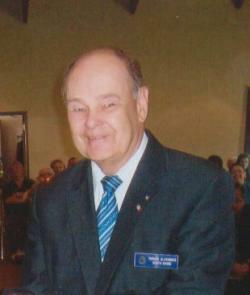 He was the owner of Bridgewater Driver Training School and taught Driver’s Education for over 30 years. Horace loved teaching and enjoyed going to work each day. He joined the Gideon’s in 1969 and was an active member up until his death. Horace was always very active in his home churches. He taught Sunday School, participated as a Treasurer, Deacon and Usher over the years. Horace is survived by his loving wife of 54 years Darlene Alexander (Barker); his sons Bartholomew Alexander (Kui Wu) grandchildren Lochlainn and Éibhleann, son Troy Alexander; grandchildren Sol and Roman; brother Edward Alexander (Joan) of Winnipeg; sister Hazel Alexander of Saint John, NB; several nieces, nephews and cousins. Apart from his parents, Horace was also predeceased by his son Jonathan; siblings Anne Carver (Bill) and Frances Hill (Ken). Resting at Journey Wesleyan Church on Tuesday April 9, 2019 from 4 to 8 pm. The funeral service will be held at Journey Wesleyan Church on Wednesday April 10, 2019 at 2 pm with Rev. Matthew Maxwell officiating, with a reception to follow. Interment will be held at a later date. Donations may be made to Gideon Bibles, Journey Wesleyan Church, Church 3:16 or to the Nasonworth Baptist Church. Bishop’s Funeral Home 540 Woodstock Road have been entrusted with arrangements.